I've been writing daily posts here on Catladyland since January of 2009 -- and have only missed one day! Obsessive much, Angie? Don't answer that. Many of you know I also write the Texts from Mittens blog, as well as maintain the whiskerslist: the kitty classifieds site. 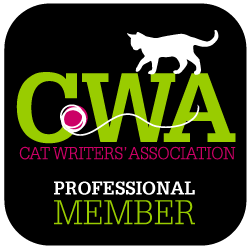 On top of that, I manage the social media for all three brands, as well as keep a pretty busy freelance writing schedule, including 4-5 days a week on Catster ... oh, and then there's the book stuff! I absolutely love what I do, and feel so grateful every day that I get to make a living writing funny stuff about cats! Believe me, I have a thankful heart every day! Catladyland is my flagship blog, and I can't even imagine letting it go; however I've decided to implement a few changes so I can better balance my time and energy. It's time for some self-care, and my cats are starting to complain that I'm not nearly at their beck and call as often as they'd prefer. Plus, I'd like to be available to participate in other projects (some cat-related, some not) as they pop up. Beginning this Monday, I'll for sure blog Mondays, Wednesdays and Fridays. I may also post other days if something special arises; however, you can always count on those three days. I plan to write longer posts, while keeping with the "silly cat humor" theme. I enjoy writing lists, so you'll probably see a few of those. The focus of Catladyland will not change: "Silly, mostly ridiculous cat humor, mostly about my cats." I hope to share more about Cosmo, Saffy and Phoebe. I'd like to create some humorous infographics, as well as add to my Fanglish cat slang dictionary. I'll continue partnering with cat-friendly companies for sponsored posts, reviews and giveaways. The social media sites (Facebook, Twitter, Pinterest, Google Plus, Instagram) will not change, and will continue to feature plenty of fun and fresh content, as well as flashback posts. That's it! Just wanted to fill you in some of the changes you can expect. 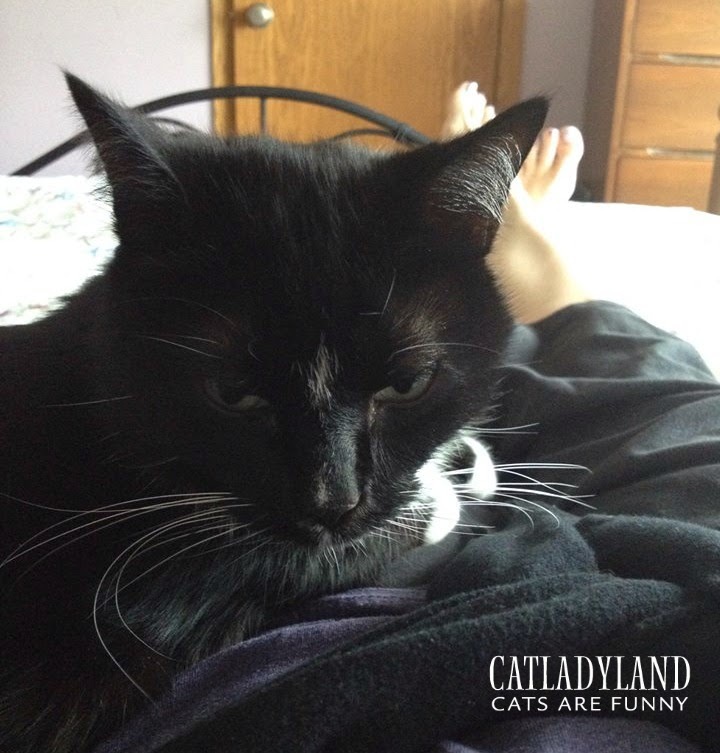 Some of you are fairly new to Catladyland, and others are loyal readers from the beginning days, when this blog was called "Eclectic Catladyland." Whoever you are, and for however long you've followed us, we just want you to know we're elated and beyond grateful that you choose to share part of your day to laugh and be silly with us! And now I'd like to leave you with a photo of Cosmo, attached to my hip and looking cranky. You know, his go-to look.